Mr Hardison lost his eyelids, ears, lips, most of his nose, and hair in 2001 when the roof of a burning home fell on him. 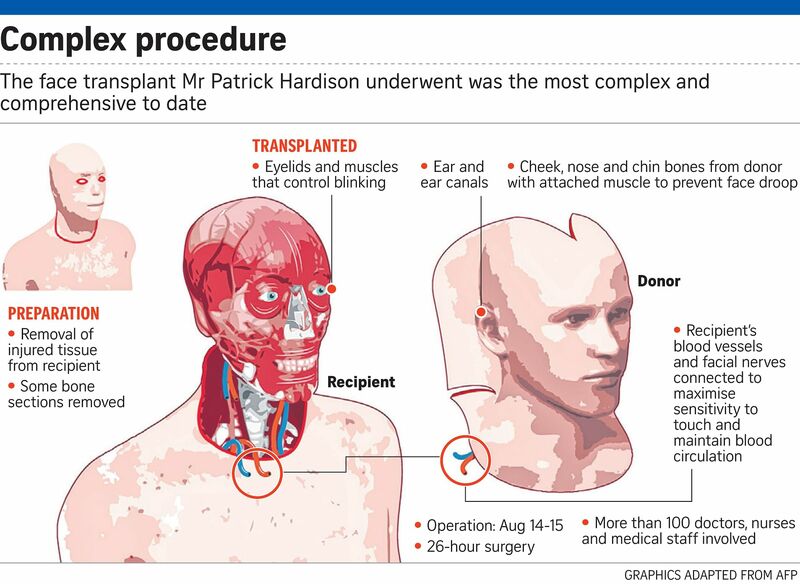 He underwent a complex face transplant in August. NEW YORK • A New York medical centre has carried out the most complex and comprehensive face transplant to date, on a firefighter horribly disfigured in 2001. More than 100 doctors, nurses and medical staff took part in the 26-hour operation on Aug 14 to 15 at NYU Langone Medical Centre, after more than a year of preparation. The recipient was Mr Patrick Hardison, 41, from Mississippi. As a volunteer firefighter in 2001, he suffered extensive facial burns when the roof of a burning home collapsed on top of him during a rescue search. He lost his eyelids, ears, lips, most of his nose, hair and eyebrows. Dr Eduardo Rodriguez led the surgery to give Mr Hardison a new face, scalp, ears, ear canals, and selected portions of bone from the chin, cheeks and nose. He was also given new eyelids and muscles that control blinking, as he was previously unable to shut his eyes completely. These were key steps to sparing his blue eyes from blindness that previously seemed all but inevitable, Dr Rodriguez said on Monday. Mr Hardison came to Dr Rodriguez after more than 70 previous surgeries, after a fellow firefighter in Mississippi wrote to the doctor who had performed an earlier face transplant in Maryland in 2012. I am deeply grateful to my donor and his family. I hope they see in me the goodness of their decision. I also want to thank Dr Rodriguez and his amazing team. They have given me more than a new face. They have given me a new life. But he had to wait for more than a year for a donor, someone with the right age, height, weight, skin and hair colour and similar bone structure, and whose family would agree. That suddenly happened in August, when Mr David Rodebaugh, a 26-year-old award-winning BMX cyclist who lived in Brooklyn, died in a road accident. His mother agreed to organ donation. NYU Langone met the US$1 million (S$1.4 million) cost of Mr Hardison's preparatory, surgical and rehabilitative care, which was similar to the cost of a liver transplant, said Dr Rodriguez. The doctor said he gave Mr Hardison a 50-50 chance of success, because he wanted him to understand the "great risk in being listed for this experimental procedure". "This is not an operation for everyone, it is for very courageous individuals," he told a news conference. Face transplants have become increasingly common since the first, partial face transplant was carried out in France in 2005 on a woman who had been mauled by her dog. In March, doctors in Barcelona reconstructed two-thirds of the lower face of a 45-year-old man terribly disfigured by disease. The same hospital in 2010 carried out the world's first full face transplant on a man who suffered an accident that left him without a nose and deformed his jaw and cheekbones. Dr Rodriguez said the New York operation would make future transplants safer and proved that the entire scalp can be transplanted with the face. The transplant of eyelids, in particular, "provides a great hope for individuals missing eyelids with vision", he said. Dr Rodriguez also said it was the most facial tissue that had been transplanted, stressing that removing all of Mr Hardison's damaged tissue was vital to making the results as normal as possible. "I am deeply grateful to my donor and his family," Mr Hardison said in a statement. "I hope they see in me the goodness of their decision. I also want to thank Dr Rodriguez and his amazing team. They have given me more than a new face. They have given me a new life." Three months later, he is starting to return to daily routine, but will remain on immune suppressant medication for the rest of his life and will require monthly check-ups. Proof of the surgery's success was obvious after a medical team took Mr Hardison shopping for new clothes at Macy's recently, and no one in the store gave him a second look.